La Piazzetta delle Noci is an unexpected surprise, with scenery breathtaking enough to justify a small detour for those walking to the Arco Natural (Natural Arch rock formation) and along the Pizzolungo trail. From your first glance, you will be utterly captivated by the view over the Natural Arch, the southern slopes of Mount Tiberius, Campanella Point, and, across the sparkling turquoise water of the Mediterranean, the Amalfi Coast. The view stretches across the sea to the horizon, making this one of the lesser known yet most panoramic spots on the Island of Capri. Continue walking for just a few steps, and you will find yourself in the hushed silence of a small pine grove, tucked away from the summer crowds and the perfect spot for a cool rest in the hottest months of the year. The beauty of the Piazzetta delle Noci doesn't stop here: this short path winds its way down a series of small terraces, each perched on a cliffhead directly over the sea far below, and each with its own unique view and picturesque vantage point. Once you've explored the terraces, you can either retrace your steps or, if you are a passionate hiker, continue along the small trail leading into the countryside right before the final terrace. Make sure that you are wearing adequate shoes before attempting this trail, but the gorgeous views and scenery at every twist and turn along the way are well-worth the hike if you are property fitted out. 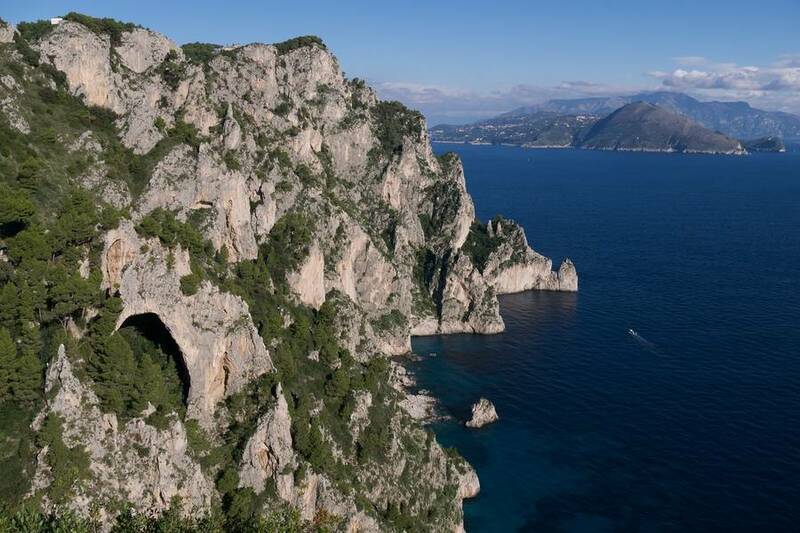 The trail takes about 30 minutes to walk and connects the Piazzetta delle Noci with the famed Pizzolungo trail, the most popular (and much less strenuous) trail on Capri. The route ends near the lovely architectural and natural masterpiece, Villa Malaparte. Stop to admire the "rationalist" architecture of the outside of the villa (the inside is closed to visitors, as it is private property), then continue on towards Tragara and the center of Capri. The walk to Piazzetta delle Noci is quite easy, and a simple pair of gym shoes will suffice. The trail from Piazzetta delle Noci to Pizzolungo requires adequate footwear (the trail isn't particularly rigorous, but there are some tricky stretches) and a bottle of water. When to go: in summer, the trail is best walked in early morning or late afternoon (before sunset, however). In the morning, you'll be walking into the sun.